Gil Ben-Shlomo, DVM, PhD, DACVO, DECVO, is a faculty member at Iowa State University, where he teaches veterinary and graduate students and trains residents in veterinary ophthalmology. Dr. Ben-Shlomo earned his DVM and PhD from Hebrew University of Jerusalem in Israel and completed a residency in comparative veterinary ophthalmology at University of Florida. He has lectured internationally and is the author of various articles, books, and book chapters. Figure 1 Nodular melanoma in the ventromedial aspect of the iris in a cat. The periphery of the mass is heavily pigmented (red arrow), whereas the center is poorly pigmented (asterisk). This melanoma invaded the ciliary body and the iridocorneal angle and caused secondary glaucoma. Multifocal iris pigmentation (white arrows) and dyscoria can also be noted. For additional considerations regarding potential malignancy of diffuse iris pigmentary changes, see Iris Freckles, Nevi, & Melanosis. Figure 2 Diffuse iris pigmentation progressing toward the iridocorneal angle in a cat. Diffuse iris melanoma cannot be differentiated from benign iris melanosis based on clinical appearance alone. Breeds predisposed to melanocytic tumors include crossbreed dogs, Labrador retrievers, German shepherd dogs, golden retrievers, schnauzers, and cocker spaniels.5 Spayed dogs are also more likely to develop both benign and malignant melanocytic tumors.5 Middle-age to older dogs are more commonly affected.5 The median age of dogs at the time of ocular melanocytoma or melanoma diagnosis is 9 years.5 Inherited melanoma affecting young adult (ie, mostly between 1-2 years) Labrador retrievers has also been reported.2 No predispositions in cats have been identified. 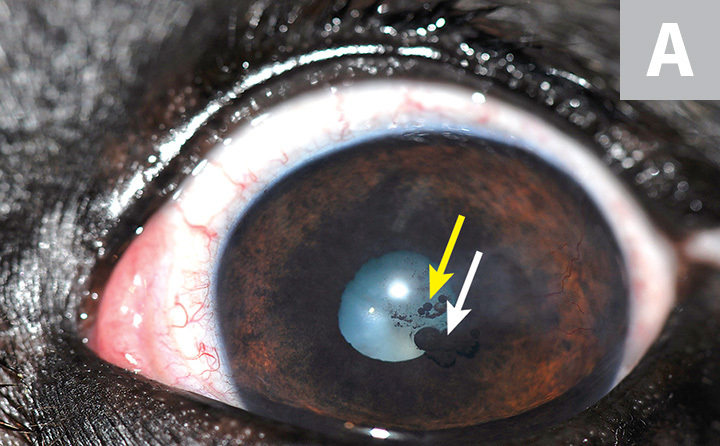 Figure 3 A cluster of small, heavily pigmented uveal cysts over the iris and close to the pupil margins (A; white arrow) and free-floating in front of the pupil (yellow arrow) in a dog. 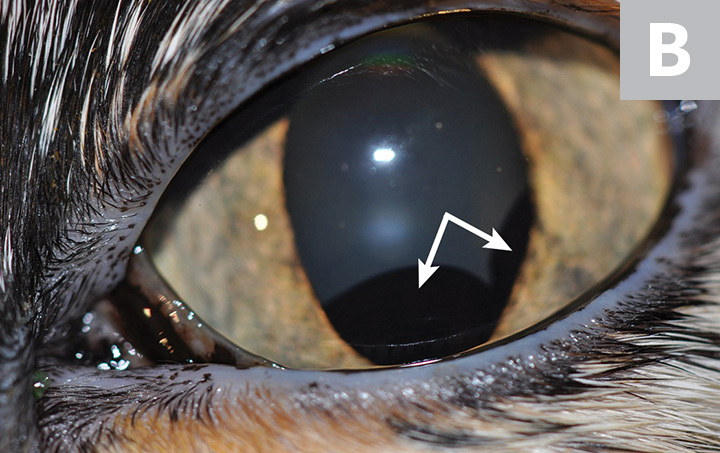 Two big, heavily pigmented uveal cysts posterior to the pupil in a cat (B; arrows). Darkly pigmented iridociliary cysts (Figure 3) may be confused with melanocytic neoplasia, particularly in cats.10 Ocular ultrasonography can be helpful in differentiating darkly pigmented cysts from uveal masses and should be performed prior to enucleation, especially in cats, as cysts are benign and do not require enucleation. 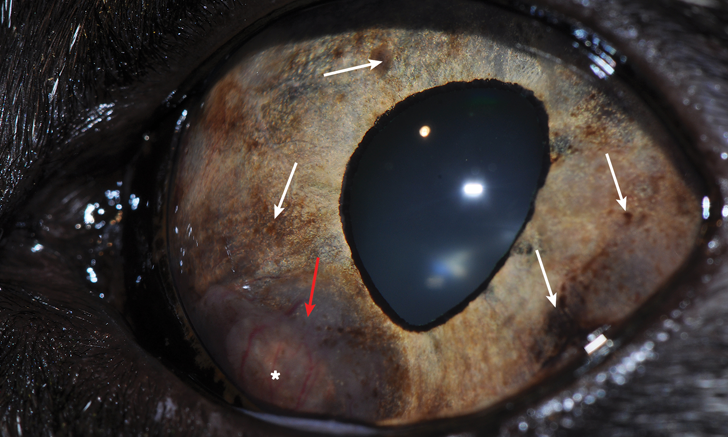 Figure 4 This aggressive iris melanoma in a dog obliterated most of the intraocular space, and the eye was enucleated (A). 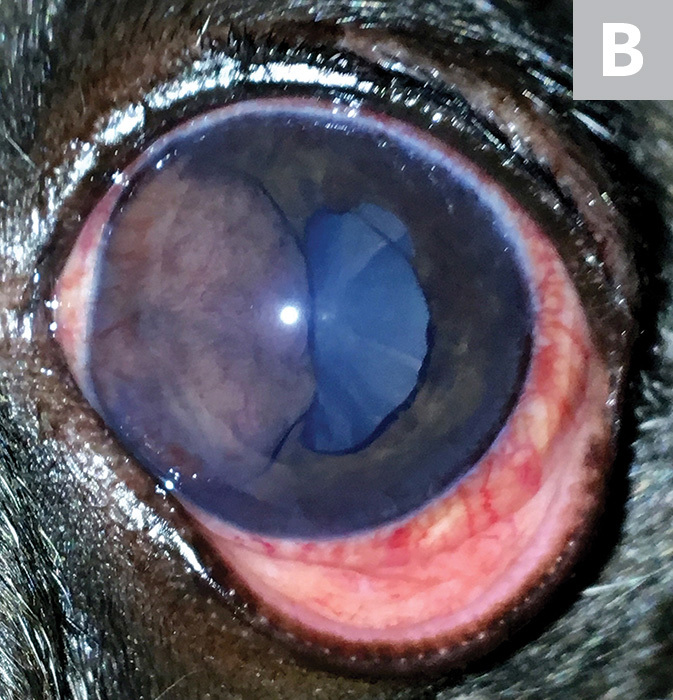 An aggressive amelanotic melanoma in a different dog (B) is present on the medial aspect of the anterior chamber, obliterating approximately one-third of the anterior chamber and causing dyscoria. Enucleation is indicated. The metastatic rate of anterior uveal melanoma is less than 5% in dogs.2 Thus, early intervention by means of referral to an ophthalmologist and referral procedures (eg, sector iridectomy, laser therapy11) should be considered in patients with focal lesions, with the aim of retaining the eye and vision. However, enucleation is advised in cases of fast-growing, locally invasive melanoma (Figure 4). Conversely, the metastatic rate of anterior uveal melanoma in cats is high (up to ≈60%),12 and early enucleation may prevent premature death.13 However, because diffuse iris melanoma cannot be clinically differentiated from benign melanosis, the decision to enucleate the eye can be challenging (see Iris Freckles, Nevi, & Melanosis). Laser treatment of suspected diffuse iris melanoma in cats has been suggested to effectively delay tumor progression14 but remains controversial due to the difficulty in differentiating benign diffuse iris melanosis from melanoma. Dubielzig RR. Ocular neoplasia in small animals. Vet Clin North Am Small Anim Pract. 1990;20(3):837-848. Martin CL. Anterior uvea and anterior chamber. In: Martin CL. Ophthalmic Disease in Veterinary Medicine. Boca Raton, FL: Taylor & Francis Group; 2009:298-336. Day MJ, Lucke VM. Melanocytic neoplasia in the cat. J Small Anim Pract. 1995;36(5):207-213. Diters RW, Dubielzig RR, Aguirre GD, Acland GM. Primary ocular melanoma in dogs. Vet Pathol. 1983;20(4):379-395. Giuliano EA, Chappell R, Fischer B, Dubielzig RR. A matched observational study of canine survival with primary intraocular melanocytic neoplasia. Vet Ophthalmol. 1999;2(3):185-190. Leland AM, Thomasy SM, Reilly CM, Kass PH, Maggs DJ. Comparing clinical perception with histologic diagnosis for feline irides with melanotic change. Paper presented at: 47th Annual Meeting of the American College of Veterinary Ophthalmologists; October 26-29, 2016; Monterey, CA. Wiggans KT, Reilly CM, Kass PH, Maggs DJ. Histologic and immunohistochemical predictors of clinical behavior for feline diffuse iris melanoma. Vet Ophthalmol. 2016;19(Suppl 1):44-55. Esson D, Fahrer CS, Zarfoss MK, Dubielzig RR. Suspected uveal metastasis of a nail bed melanoma in a dog. Vet Ophthalmol. 2007;10(4):262-266. Miller PE. Diseases of the uvea. In: Maggs DJ, Miller PE, Ofri R, eds. Slatter’s Fundamentals of Veterinary Ophthalmology. 6th ed. St. Louis, MO: Elsevier; 2017:254-278. Fragola JA, Dubielzig RR, Bentley E, Teixeira LBC. Iridociliary cysts masquerading as neoplasia in cats: a morphologic review of 14 cases. Vet Ophthalmol. 2018;21(2):125-131. Cook CS, Wilkie DA. 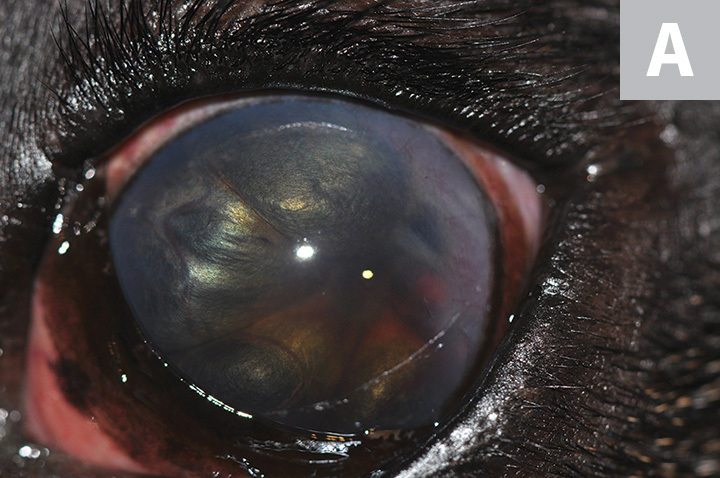 Treatment of presumed iris melanoma in dogs by diode laser photocoagulation: 23 cases. Vet Ophthalmol. 1999;2(4):217-225. Patnaik AK, Mooney S. Feline melanoma: a comparative study of ocular, oral, and dermal neoplasms. Vet Pathol. 1988;25(2):105-112. Kalishman JB, Chappell R, Flood LA, Dubielzig RR. A matched observational study of survival in cats with enucleation due to diffuse iris melanoma. Vet Ophthalmol. 1998;1(1):25-29. 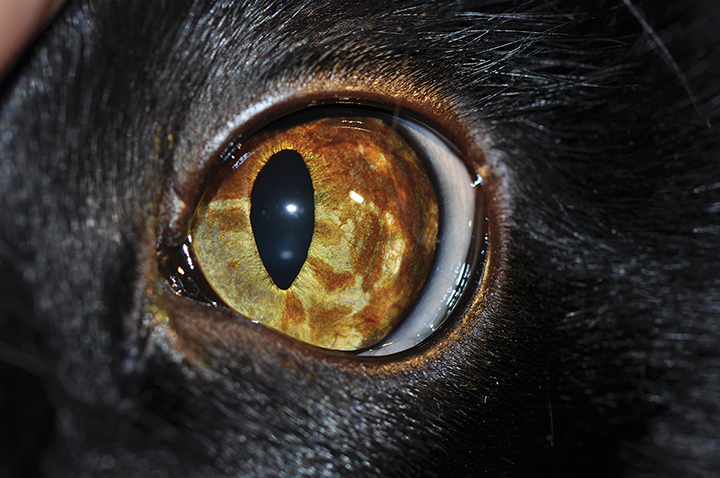 Nadelstein B. Laser treatment of suspected diffuse iris melanoma lesions in cats. Paper presented at: The 2nd Veterinary Ophthalmic Surgery Meeting; 2018; Chicago, IL. Labelle AL, Labelle P. Canine ocular neoplasia: a review. Vet Ophthalmol. 2013;16(Suppl 1):3-14. Smith SH, Goldschmidt MH, McManus PM. A comparative review of melanocytic neoplasms. Vet Pathol. 2002;39(6):651-678. Wang AL, Kern T. Melanocytic ophthalmic neoplasms of the domestic veterinary species: a review. Top Companion Anim Med. 2015;30(4):148-157.